Instill classic mission style in your bedroom with this beautiful dresser. The piece features eight drawers for storage, and is crafted of cherry solids and veneers. 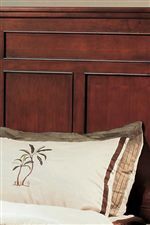 A hand-rubbed Classic Cherry finish exudes warmth, while details like bead molding and block legs with stretchers create a simple mission look. 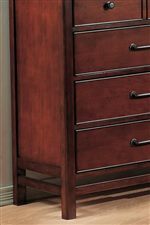 The Willow Creek 8-Drawer Dresser with Block Feet by Winners Only at Crowley Furniture & Mattress in the Kansas City Area: Liberty and Lee's Summit, MO & Overland Park, KS area. Product availability may vary. Contact us for the most current availability on this product. The Willow Creek collection is a great option if you are looking for Mission furniture in the Kansas City Area: Liberty and Lee's Summit, MO & Overland Park, KS area.